First Appearance: Tales to Astonish (vol. 1) #44 (June 1963): "The Creature from Kosmos!" BELOW: The Wasp: "Thank Heavens": The Wasp is not portrayed as particularly religious, but she appears to have at least some religious sensibility. When she finds herself alive rather than tramples because of a fortuitous gap in the ground, she spontaneously thinks "Thank Heavens the ground here is so uneven!" The phrase "Thank Heavens" or "Thank Heaven" is often used by religiously observant people as an intentional way to avoid taking the Lord's name in vain (one of the Ten Commandments). Is this why the Wasp uses this phrase? Possibly. But this may be more of a linguistic expression borne of a religious background or upbringing rather than a conscious, intentional expression of gratitude to the Divine. 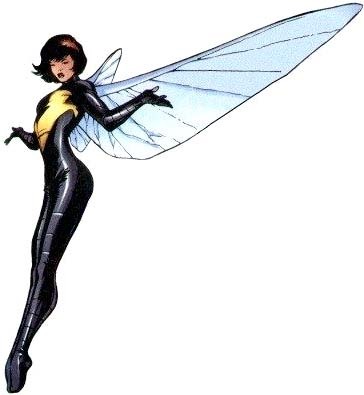 BELOW: The Wasp senses an evil presence: The Wasp (Janet Van Dyne) here demonstrates an unusual ability sometimes attributed to her in early Marvel stories but later forgotten: the ability to sense evil. 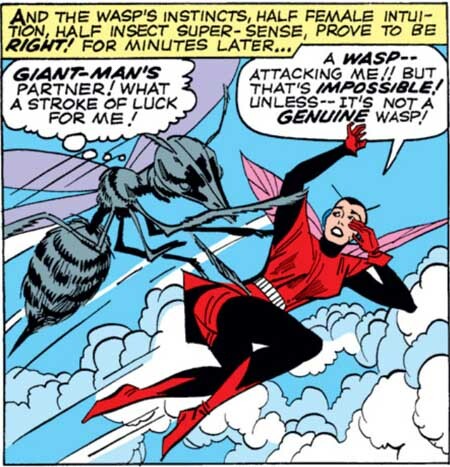 In this scene, the Wasp is sensing the evil Space Phantom, who has transformed himself into a wasp in order to escape detection from the Avengers. Comic book writers with a more scientific outlook, such as Mark Gruenwald, have made the point that "evil" is an abstract religious concept and doesn't really have a scientifically discernible physical manifestation, despite how it is sometimes portrayed in comics. Thus, "sensing evil" would be a purely spiritual (or at least mystical ability). 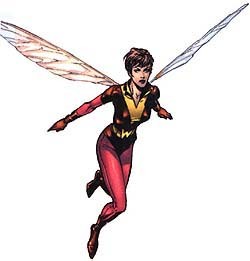 Yet the Wasp's powers were given to her by purely scientific means by Hank Pym, a very secular-minded scientist. Wasp's ability to sense "evil" is particularly interesting because throughout her career as a super-hero, she herself has largely been a secular character. Then again it wasn't like Banner was the only one whose character could be considered . . . murky. They all had secrets... And Janet, ah, Janet. Darling, Tony thought, nobody likes a mutant. Yet here you are. Something had been on his mind, distracting him in the middle of sentences. He hadn't even commented on her dress, which she'd chosen specifically to provoke him because he was still such a fuddy-duddy about women's clothing. BELOW: The Wasp's ability to sense evil ascribed to "half female intuition, half insect super-sense": The Wasp's ability to sense "evil" is not explicitly identified as a "spiritual" or "religious" ability (although "evil" is a religious/spiritual concept). Rather , it is said to be "half female intuition, half insect super-sense." Early Marvel writers often spoke of "female intuition" as a mysterious, almost mystical sixth sense. In the Last Avengers Story, the Wasp said she didn't believe in God. ...Hey, does anyone think Jan is a hedonist? The Amazing Spider-Man (vol. 1) #283 (Dec. 1986): "With Foes Like These..."
Avengers / Thunderbolts #1 (May 2004): "One: The Cause of Justice"
Avengers / Thunderbolts #2 (Early June 2004): "Two: The Fine Line"
Avengers / Thunderbolts #4 (July 2004): "Four: Betrayal"
Avengers / Thunderbolts #5 (Aug. 2004): "Five: Truth and Consequences"
Avengers / Thunderbolts #6 (Sep. 2004): "Six: Blood Will Tell"
The Avengers (vol. 1) #28 (May 1966): "Among Us Walks... A Goliath!" The Avengers (vol. 1) #34 (Nov. 1966): "The Living Laser!" The Avengers (vol. 1) #43 (Aug. 1967): "Color Him... the Red Guardian!" The Avengers (vol. 1) #47 (Dec. 1967): "Magneto Walks the Earth!" The Avengers (vol. 1) #48 (Jan. 1968): "The Black Knight Lives Again!" The Avengers (vol. 1) #49 (Feb. 1968): "Mine is the Power!" The Avengers (vol. 1) #50 (Mar. 1968): "To Tame a Titan!" The Avengers (vol. 1) #51 (Apr. 1968): "In the Clutches of the Collector!" The Avengers (vol. 1) #52 (May 1968): "Death Calls for the Arch-Heroes!" The Avengers (vol. 1) #54 (July 1968): "...And Deliver Us from -- the Masters of Evil!" The Avengers (vol. 1) #57 (Oct. 1968): "Behold... the Vision!" The Avengers (vol. 1) #59 (Dec. 1968): "The Name Is Yellowjacket"
The Avengers (vol. 1) #75 (Apr. 1970): "The Warlord and the Witch!" The Avengers (vol. 1) #152 (Oct. 1976): "Nightmare in New Orleans!" The Avengers (vol. 1) #158 (Apr. 1977): "When Avengers Clash!!" The Avengers (vol. 1) #178 (Late Oct. 1992): "The Martyr Perplex!" The Avengers (vol. 1) #188 (Oct. 1979): "Elementary, Dear Avengers!" The Avengers (vol. 1) #190 (Dec. 1979): "Heart of Stone"
The Avengers (vol. 1) #194 (Apr. 1980): "Interlude"
The Avengers (vol. 1) #195 (May 1980): "Assault on a Mind Cage!" The Avengers (vol. 1) #203 (Jan. 1981): "Night of the Crawlers"
The Avengers (vol. 1) #267 (May 1986): "Time -- And Time Again!" The Avengers (vol. 1) #273 (Nov. 1986): "Rites of Conquest!" Avengers (vol. 1) #393 (Dec. 1995): "Dark Days Dawn"
Avengers (vol. 1) #394 (Jan. 1996): "Bad Blood"
Avengers (vol. 1) #500 (Sep. 2004): "Chaos: Part One of Four"
Avengers (vol. 1) #501 (Oct. 2004): "Chaos: Part Two of Four"
Avengers Annual #15 (Oct. 1986): "Betrayal!" Avengers West Coast Annual #5 (Sep. 1990): "When Titans Thrash!" Avengers: A Marvel Treasury (1982): "Behold... the Vision!" Avengers: Deathtrap, The Vault (Sep. 1991): "Deathtrap, the Vault"
Black Goliath #1 (Feb. 1976): "Black Goliath"
Captain America (vol. 1) #116 (Aug. 1969): "Far Worse Than Death!" Captain America (vol. 1) #224 (Aug. 1978): "Saturday Night Furor!" Captain America (vol. 1) #250 (Oct. 1980): "Cap For President!" Captain America (vol. 1) #286 (Oct. 1983): "One Man in Search of... Himself!" Captain America (vol. 1) #290 (Feb. 1984): "Echoes"
Captain America (vol. 1) #295 (July 1984): "The Centre Cannot Hold!" Captain America (vol. 1) #296 (Aug. 1984): "Things Fall Apart!" Captain America (vol. 1) #299 (Nov. 1984): "The Bunker"
Captain America (vol. 1) #301 (Jan. 1985): "All Good Things..."
Captain America (vol. 1) #314 (Feb. 1986): "Asylum"
Captain America (vol. 1) #318 (June 1986): "Justice Is Served!" Captain America (vol. 1) #400 (May 1992): "Out in the Cold"
Captain America 70th Anniversary Magazine #20 (Winter 2011): "Cap For President!" The Defenders (vol. 1) #76 (Oct. 1979): "Little Triggers!" The Defenders (vol. 1) #77 (Nov. 1979): "Waiting for the End of the World!" The Defenders (vol. 1) #78 (Dec. 1979): "The Return of the Original Defenders!" The Defenders (vol. 1) #79 (Jan. 1980): "Chains of Love!" The Defenders (vol. 1) #80 (Feb. 1980): "Once a Defender"
The Defenders (vol. 1) #81 (Mar. 1980): "War in Ogeon!" Giant-Size Avengers (vol. 2) #1 (Feb. 2008): "Gossip Girls"
Giant-Size Defenders #4 (Apr. 1975): "Too Cold a Night For Dying!" Hulk Smash Avengers #2 (July 2012): "The Filth and the Fury"
The Incredible Hulk (vol. 2) #154 (Aug. 1972): "Hell is a Very Small Hulk!" Iron Man (vol. 1) #18 (Oct. 1969): "Even Heroes Die!" Marvel Fanfare (vol. 1) #57 (June 1991): "A Norman Breyfogle Portfolio"
Marvel Feature (vol. 1) #4 (July 1972): "The Incredible Shrinking Doom"
Marvel Feature (vol. 1) #5 (Sep. 1972): "Fear's the Way He Dies"
Marvel Feature (vol. 1) #6 (Nov. 1972): "Hellstorm"
Marvel Feature (vol. 1) #7 (Jan. 1973): "Paranoia Is the Para-Man"
Marvel Feature (vol. 1) #8 (Mar. 1973): "Prelude to Disaster"
Marvel Feature (vol. 1) #9 (May 1973): "The Killer Is My Wife"
Marvel Feature (vol. 1) #10 (July 1973): "Ant-Man No More"
Marvel Graphic Novel #16 (Sep. 1985): "The Aladdin Effect"
Marvel Knights Spider-Man #2 (July 2004): "Down Among the Dead Men: Part Two"
Marvel Super-Heroes #380 (Dec. 1981): "Color Him... the Red Guardian!" Marvel Super-Heroes #385 (May 1982): "Heart of Stone"
Marvel Two-in-One (vol. 1) #75 (May 1981): "By Blastaar-- Betrayed!" Maximum Security #1 (Dec. 2000): "Illegal Aliens"
Maximum Security #2 (Dec. 2000): "A World of Hurt"
The New Avengers (vol. 2) #7 (Feb. 2011): "Avengers Assemble: The Oral History of the Earth's Mightiest Heroes: Chapter 14"
Omega the Unknown Classic (Dec. 2005): "Little Triggers!" Omega the Unknown Classic (Dec. 2005): "Waiting for the End of the World!" Omega the Unknown Classic (Dec. 2005): "The Return of the Original Defenders!" The Order (vol. 1) #3 (June 2002): "Ultimatum: Avengers"
The Rampaging Hulk (vol. 1) #8 (Apr. 1978): "Gallery of Villains"
Solo Avengers #12 (Nov. 1988): "Love Stings"
Tales to Astonish (vol. 1) #46 (Aug. 1963): "When Cyclops Walks the Earth"
Tales to Astonish (vol. 1) #47 (Sep. 1963): "Music to Scream By"
Tales to Astonish (vol. 1) #48 (Oct. 1963): "Ant-Man and the Wasp Defy the Porcupine!" Tales to Astonish (vol. 1) #58 (Aug. 1964): "The Coming of... Colossus"
Tales to Astonish (vol. 1) #63 (Jan. 1965): "A Marvel Masterwork Pin-Up"
The Thing (vol. 2) #8 (Aug. 2006): "Last Hand"
Thunderbolts (vol. 1) #44 (Nov. 2000): "Keeping an Ion the Crowd!" Thunderbolts: Life Sentences #1 (July 2001): "Life Sentences"
Ultimate Captain America Annual #1 (Dec. 2008): "Training Day"
The West Coast Avengers (vol. 2) #1 (Oct. 1985): "Teammates!"